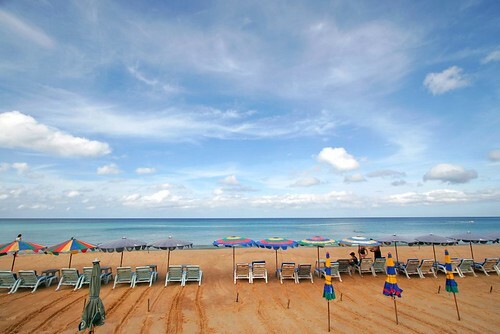 More great weather - see you in Phuket! Since the last Phuket weather blog update, we have actually had a tiny bit of rain. Must have had more than a few mm yesterday at Karon beach where I was working, but my rain gauge at home (near Phuket Town) said 2mm. Saturday also had some scattered showers, but nothing much, and (see below) we drove around and found plenty of sun. This morning (Monday) - looks perfect as I write this at 7:30am. What is the "situation" in Phuket? People keep asking me pretty much the same question on Twitter or Facebook. There is NO situation here. Weather is great, there is no flooding or bad weather. The nearest floods are around Bangkok, some 800km from here. Would you cancel a ski trip to the Alps because of floods in Paris? Same kind of distance. Also - TV images don't tell the whole story. There is flooding around Bangkok but not much in the center, and the airport is operating 100% normally. 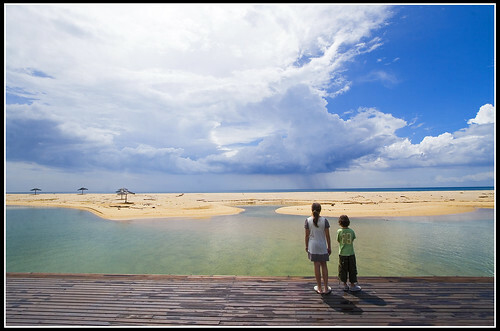 As far as a trip to Phuket is concerned, there is nothing to worry about. I had customers at our dive shop on Friday. They were staying in Hua Hin, they had to drive into Bangkok, get a flight to Phuket.. they were worried... and had absolutely no problems. It's high season now, weather is sweet, fish are jumpin' and cotton is high. The great weather lasted the whole week. I normally take Saturday off work, and was concerned this Saturday. Just as we were getting ready to go out, the wind blew stronger, dark clouds gathered all around... what the? 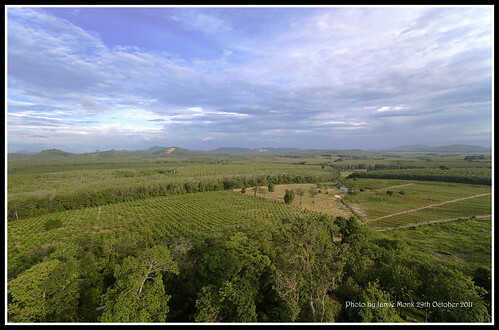 Might be enough to put off a timid soul, but we know the weather here is quite localised, and we planned to drive north, off Phuket over the bridge to Phang Nga province. Drove through some rain, but found the sun. We explored a side road just after the bridge that heads to Natai Beach, where you find some big houses and some hotels .. and a beach. Photo above at the Hot Spring Resort which looks like a nice place to stay well away from the crowds. We then had a huge lunch at Samchong Seafood in Phang Nga.. its about 20km from the bridge on the way to Phang Nga town. 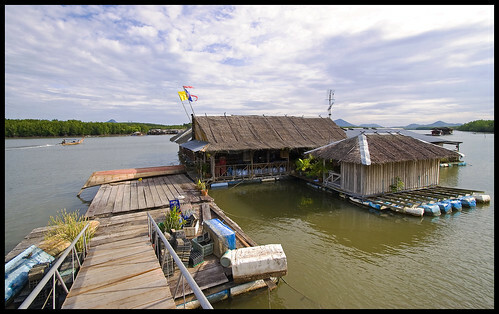 The restaurant is floating in a wide mangrove canal with a small muslim fishing village on the opposite shore. Longtail boats cross back and forth every few minutes. 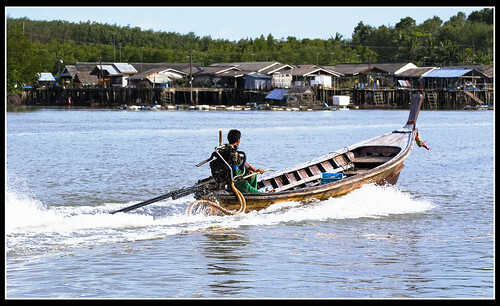 You can also hire boats here to get out into Phang Nga Bay. Let's see if I have a few spare minutes to take a photo today! But trust me, it's beautiful weather right now. Anyone worried about floods or weather - there is nothing to worry about. See you in Phuket!